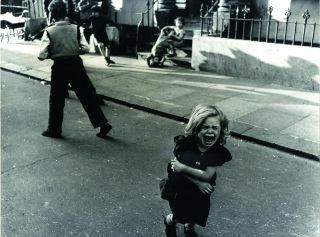 As a young photographer, Roger Mayne visited the slums of north Kensington 27 times, taking 1,400 photographs. It was in 1956 that he first came across Southam Street in north Kensington, some two years after he had moved to London. It was a slum, mostly demolished in 1969, but Mayne was enthralled by the unrestrained way that its residents lived and behaved. He took 64 photographs on his first day alone. Although he avoided directly political statements, he was drawn to photographing poorer working-class communities, a fascination most famously expressed in his north Kensington work. “I think an artist must work intuitively, and let his attitudes be reflected by the kinds of things he likes or finds pictorial,” he wrote. “Attitudes will be reflected because an artist is a kind of person who is deeply interested in people, and the forces that work in our society. This implies a humanist art, but not necessarily an interest in ‘politics’.” Mayne’s lifelong fascination with people – their moods, expressions, relationships and interactions, both with each other and their environment – permeates his work. It’s easy to forget that his photographs of the ever-fascinating Southam Street were only part of a much wider body of work. The exhibition, curated by Karen McQuaid and Anna Douglas, in association with Mayne’s daughter, Katkin Tremayne, brings to the fore some of the other projects that the Southam Street work overshadows: bicycle factories in Nottingham to council estates in Bermondsey. You’re struck by the consistently high quality of Mayne’s work and the way he continued to develop underlying themes such as changing youth culture, social housing and immigration. It smacks of Paul Strand, one of his biggest influences, but without the political edge: it explores his approach to photography as an art form through his willingness to experiment and innovate. Mayne, born into a middle-class family in 1929, didn’t initially seem destined for a life in photography. After being privately educated at Rugby School, he studied chemistry at Balliol College, Oxford University. He didn’t enjoy it and in his spare time, inspired by Henri Cartier-Bresson and W Eugene Smith, he began taking photographs of his own. By his final year in 1951, he had his first images published in Picture Post – a photo-essay on a ballet film. After university, he was expected to undertake two years’ national service, but his pacifist beliefs led him instead to work as a hospital porter in Leeds. While living there, he began shooting his earliest street images and developed his distinctive ‘realist’ style. By the time he held his first UK exhibition, at the Institute of Contemporary Arts in London in 1956, he was freelancing for a range of magazines including Vogue, Queen, New Left Review and Peace News. He gained the trust and acceptance of people in the street and captured people in the everyday dramas and quiet moments of their daily lives without either romanticising or patronising them. He used a pre-focused Zeiss Super Ikonta and often got such close proximity to his subjects that one feels immersed in their world. Many of his photographs concentrate on the action-packed lives of the street’s children – playing football, fighting, smoking, giggling – against the contrasting backdrop of run-down houses. The buildings may be decaying and hazardous to health, but the streets are full of life. Mayne’s pictures record the changing youth culture and emerging groups of Teddy Boys as well as early signs of multiculturalism with the arrival of West Indian immigrants. The Southam Street work, which Mayne pursued for five years, contains around 1,400 images. They were quickly recognised as making a significant body of work. One of the images was selected by the novelist Colin MacInnes as the cover of his 1959 book Absolute Beginners, then 57 of them were published in Theo Crosby’s design magazine Uppercase in 1961. A selection of the work was later published by the V&A as The Street Photographs of Roger Mayne (1986). The other work featured in the exhibition includes a 1964 documentary series made at Raleigh Cycles in Nottingham. Mayne initially took some pictures of the factory while working alongside a BBC documentary film-maker, but subsequently returned several times to develop the work further. Shot in the low light of the factory floor, these sensitive portraits highlight the dignity and diligence of the workers. Mayne wasn’t restricted solely to the company of photographers, and was also friends with abstract painters from the St Ives school of artists including Patrick Heron, Roger Hilton and Terry Frost. This wider interest in the arts encouraged him to think of new ways of presenting photographic images, including large-scale prints and diptychs and triptychs, as well as installation work. Mayne went on to work for the Observer and The Sunday Times colour magazines and taught at Bath Academy of Art from 1966 to 1969. In the 1970s, he moved to Lyme Regis in Dorset with his family. His work broadened to include landscapes, while still exploring the theme of childhood in photographs of his own children and later grandchildren. In the 1980s he shot street pictures in China, Japan and Goa, and in the nineties he was still out photographing street scenes in countries including France, Spain and Italy. He continued working until late in life and died in 2014 at the age of 85. While Mayne’s documentary work in the fifties and sixties was his most significant contribution, McQuaid believes it’s the way that he engaged with the medium that set him apart from his contemporaries. “He was certainly ahead of his time in his thinking about how photography fitted into wider culture,” she says. It was originally commissioned by architect Theo Crosby for an international design showcase, the Milan Triennale. It consists of 310 colour slides projected onto five screens, accompanied by a specially commissioned jazz score by British composer John Scott. Images include the leisure interests of a broad spectrum of British society, from working-class crowds at football grounds to upper-class hunting enthusiasts.